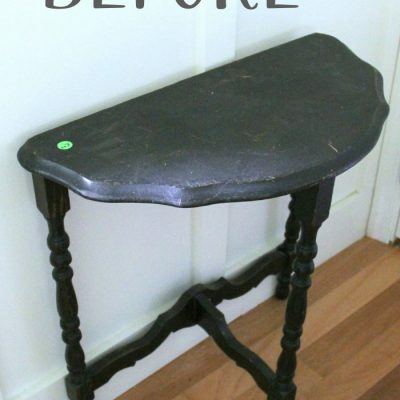 I’m sharing a two tone milk paint makeover today for themed furniture makeover day! Here’s how she started out…. These months sure do fly on by. It seems like I finish one project and the next thing I know it’s time for another! 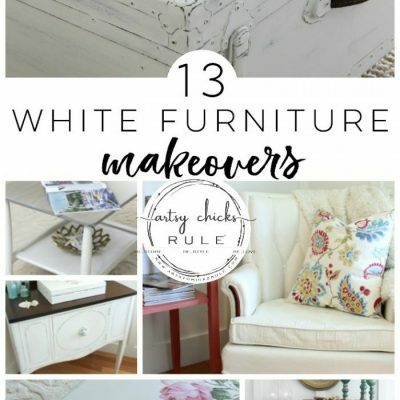 –to see previous month’s themed furniture makeovers, click –> here. So, as it seems to be, with me anyway, what I first “envisioned” didn’t quite pan out. I do have hope for the original vision on another piece but it just did not work out for this one. Here’s what I ended up with instead…. 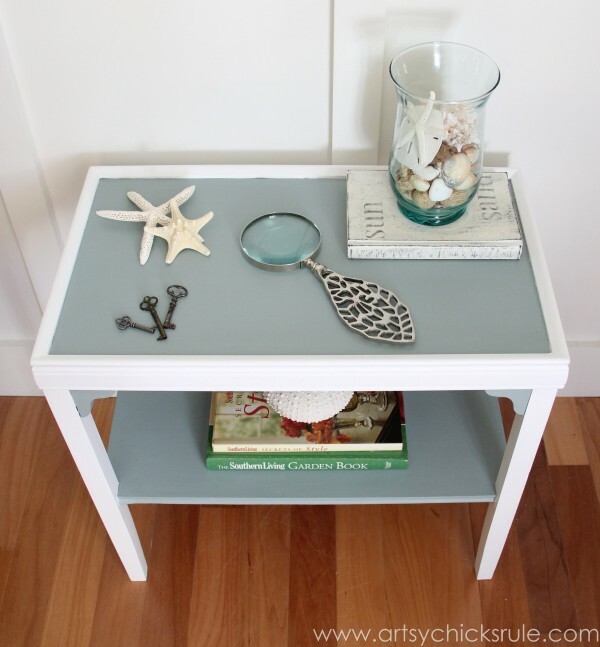 A little side table with a Milk Paint makeover. I didn’t even “clean her up” for the photo. That’s how I got her. All dirty and neglected. 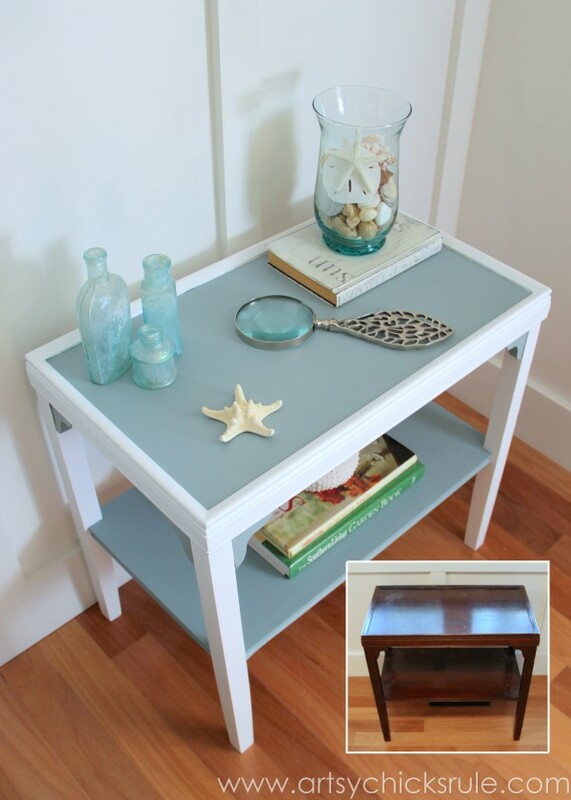 I used *General Finishes Persian Blue and *Snow White Milk Paints to paint this table. Loving their paints, by the way. 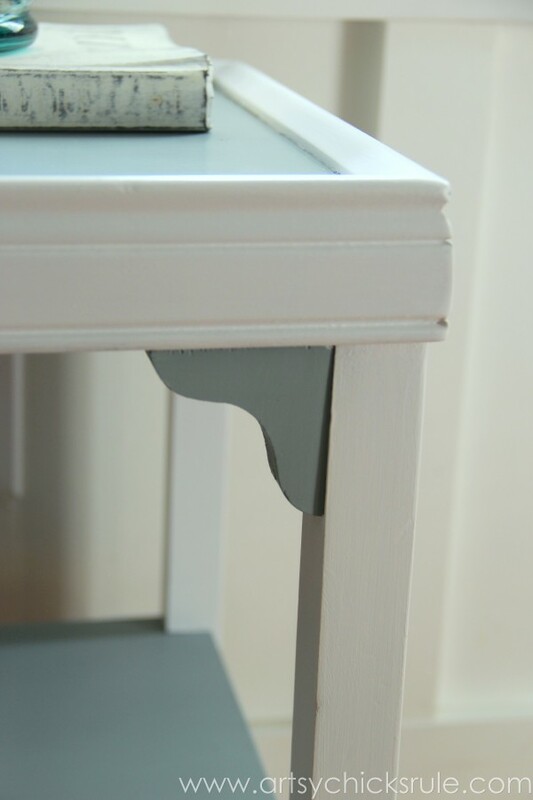 The Persian Blue is similar to Duck Egg Blue Chalk Paint that I use a lot but has bit more of a gray tone to it. Which I really love for something similar but a little different. 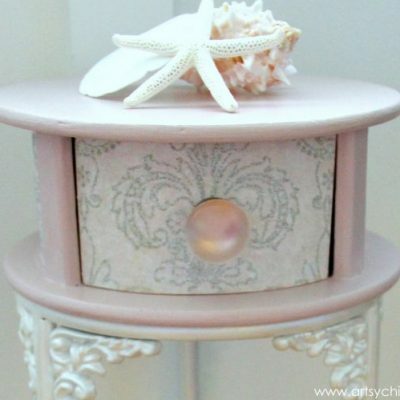 BUT anyway…I had originally planned to paint it silver and a really pretty mauve/gray color (bottom shelf and accents) with a bit of decoupage (top). Isn’t the silver pretty? I was a bit bummed it didn’t work out. And in case you are curious, I ended up not liking the way the paper decoupage was looking with the silver. So I changed gears…in a really big way. And honestly, I’m kind of glad I did. It all works out in the end. 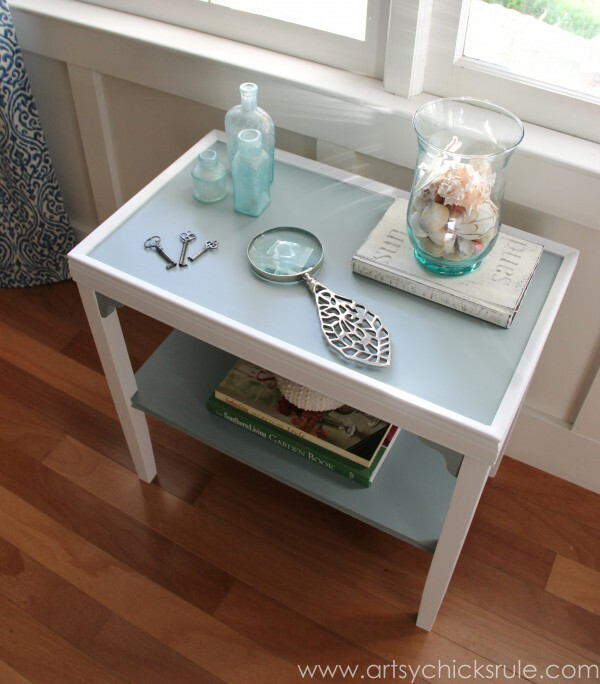 This pretty little table is going outside in between my two white rockers on the front porch. 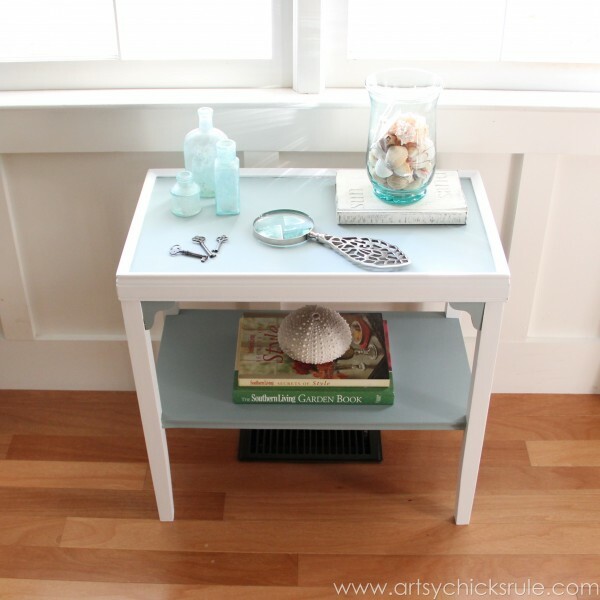 It’s going to look great out there since the predominant color is Duck Egg – Persion Blue-ish….with white furniture. I really think I need to stop talking about it and just go ahead and paint my front door the same color too. But for now…some close ups of the “stuff” I styled it with. Can never have enough seashells. I don’t think so anyway. And the book….I actually painted a black book I picked up at the thrift store with Chalk Paint (it’s not old, don’t worry! ), sanded it a bit and stenciled some words onto it. Some of my old blue bottle collection. LOVE. So there you have it…my “two-tone” contribution. Be sure to check out all of my friends “two tone” projects below too! ENJOY the rest of the “two-tone” projects from my talented friends below!!! Love it! I have got to try the General Finishes! 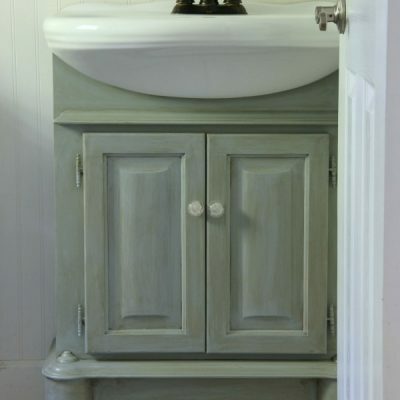 Is this only painted with the milk paint, or do you apply any type of top coat with it? I love the painted book idea!!! thanks! Thanks Melissa!! Yes, you do, I am really loving the paint! This one is only painted in Milk Paint. No finish coat. The guy at the paint store said it is rock solid and doesn’t really need a top coat. It seems to be true! I have used wax and poly as a top coat on other pieces though. This one will stand the true test…it will be outside on my porch. Not directly in weather conditions though. I love the colors and the seascape theme! And I love your wood floors… we have similar flooring in our house where the wood is a variety of tones- it gives the house a country feel. The floors are Mahogany from Lumber Liquidators. We installed them in our Family Room about 7 years ago. We have really enjoyed them minus the carpet that used to be in there! Really want to try the General Finishes paint even more now. 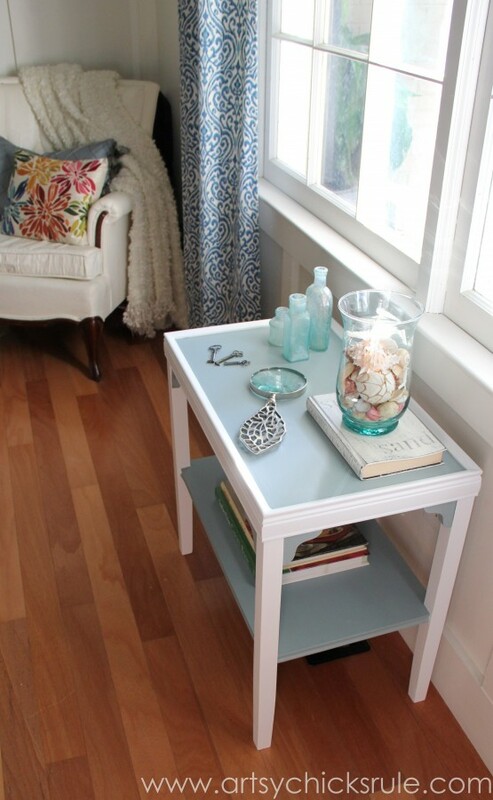 Gorgeous colors together on your side table Nancy! 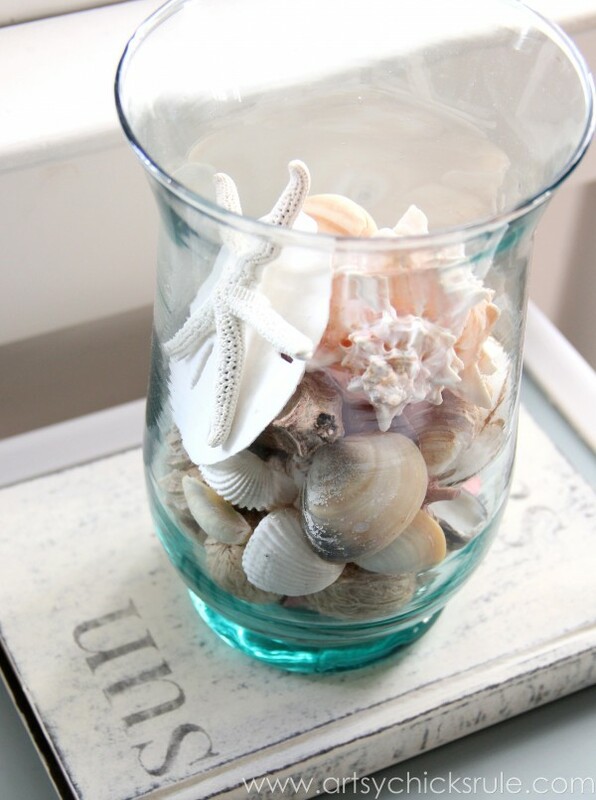 And I totally agree…you can never have too many sea shells! So pretty! 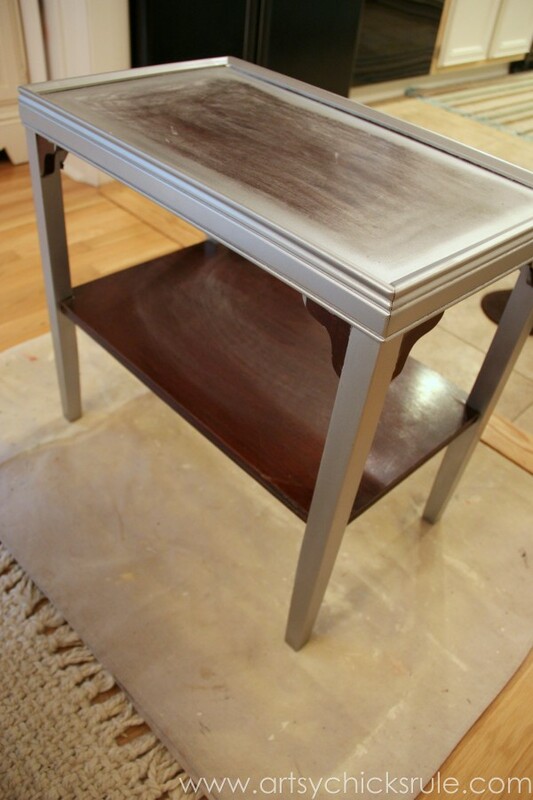 I love the two paint colors you used for your table and think that it will look great on your front porch. I wish I had a front porch big enough for furniture! Love the colors you painted it Nancy, it’s so fresh and…well coastal! I must try your painted book idea – love it! I like the sounds of the silver and mauve direction you were going as well – the silver looked gorgeous. This is a fun monthly theme you guys are doing. Talk about a bunch of talented ladies! Thank you Marie :) Oh yes, the book I did awhile back. I need to do more!! Love the look. I agree, this is a talented bunch!! It’s always fun to see what everyone comes up with! I too have fallen in love with GF Milk Paints!!!! They go on so smooth – the colors are gorgeous! And of course your piece is beautiful (as usual). I’ve been busy buying – now I have to get busy painting! Have you used their gel stain- specifically their Java Gel and their glazes are beautiful!!!! Yes, me too, same reasons!! I am really enjoying working with it. Thank you! And YES …. lol…that is the exact stain I bought. I have used it as a glaze on a really small project but not like I really want to yet!!! Can’t wait. I’m loving it too. And the gel topcoat! Yum! 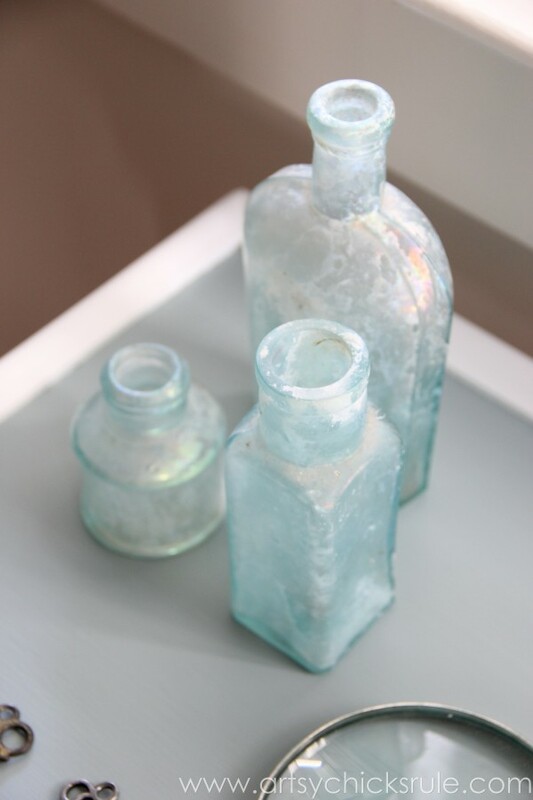 I love those blue bottles! Your table turned out great. You guys have so many fun projects! This table is perfect. The colors are so soothing! I just picked up a very similar table at a yard sale for $10.00!! Now I know what I’m going to do with it! I may add a little decoupage, just for fun! I am redecorating my family room to a light beachy look so that I will always feel relaxed, like I do at the beach, Great site! I scroll through your projects everyday . Thanks for the inspiration & motivation! 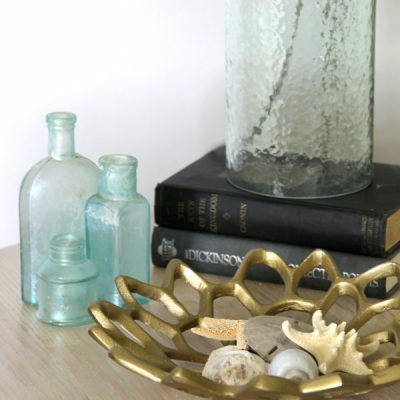 This table looks perfectly beachy/coastal – I’m sure it will be beautiful on your front porch. 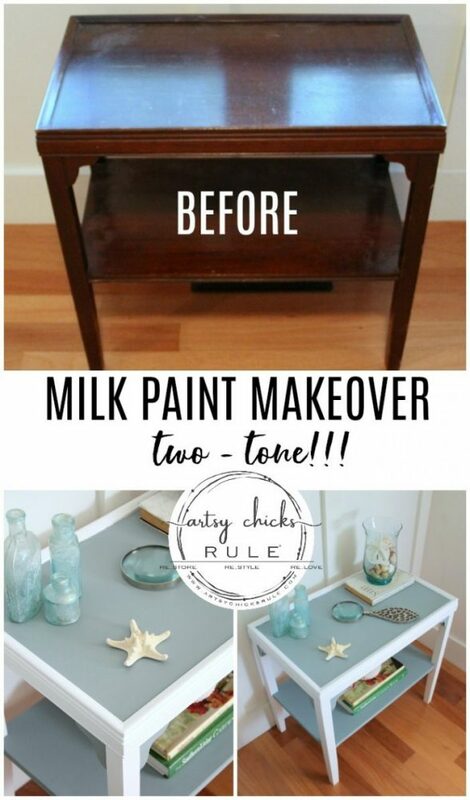 I still haven’t tried milk paint- I need to someday! 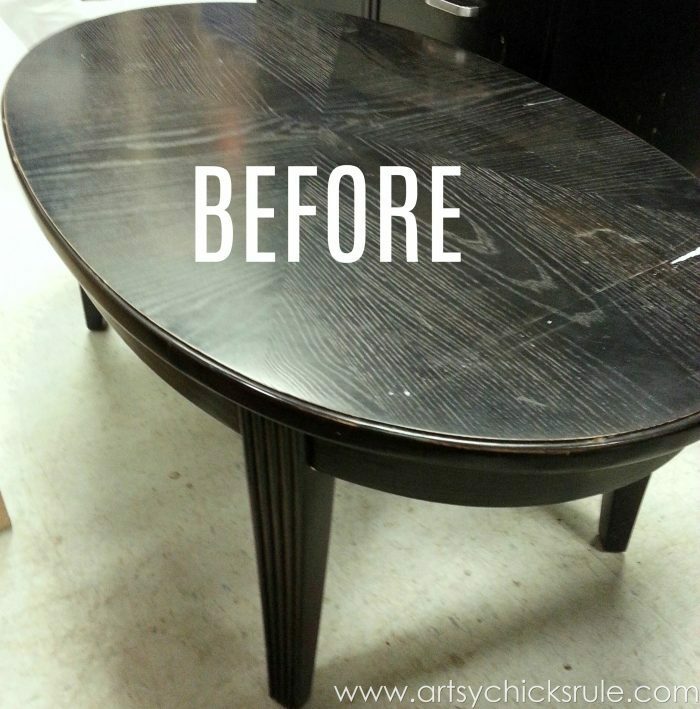 The table makeover is stunning and your styling is equally gorgeous. It would fit perfectly into our coastal home. I’m sharing it Saturday with my readers with a direct link back here. 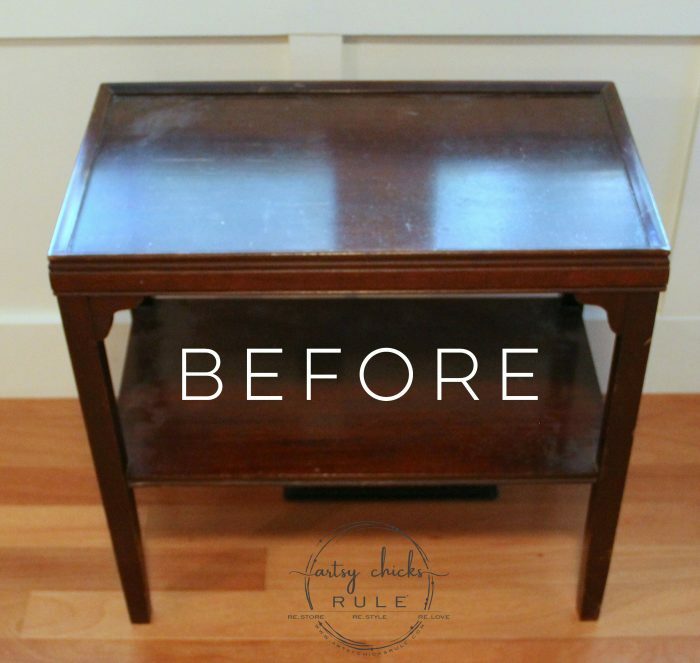 Does this group of bloggers that do a themed furniture makeover accept new bloggers? It would totally fit into my obsession (and my blog!). Thanks so much Kathy! :) Oh! and thanks so much for the feature! We have a set number in our group, and are at that number, so aren’t looking for any new members at the moment! So Pretty! I love the blue two toned choice. I think the silver would have worked out too..but love the blue! ..and yes, just paint your front door girlfriend..I know it will be stunning! :) It’s only paint! Ahhhh how I LURVE a blue and white combo. Great job Nancy. This looks completely different and so much better! I have no idea what I will paint with the silver yet! I have to find a new piece of furniture for it. I love the look and the possibilities are endless! Hi – adorable! How did you prep the table? Did you strip /sand? I’m a newbie at this. Thanks. I did do a light sanding (very light). No stripping. But I had painted it with silver spray paint first. I just went right over that with the Milk Paint. I love the colors you used. I know what you mean about shifting gears halfway through a project. I seem to do that a lot! Your table looks great! Thanks Angie! I am really loving that Persian Blue. :) Haha glad I’m not the only one!